Do you wanna save more time and water on watering your plant? Do you wanna to water your plant automatically? Who could take careful of your plan when you are on vacation, business trip or very busy with your work? The Irrigation Drip kits will make your watering more easy and convenient. Stop watering your plant by hands. Just turn on the tap, it could water your plant your automatically. Free of worrying your plant withering when you are away from home. Easy Installation: can be directly connected to the threaded faucet.Perfect for the washing machine tap. Adjustable Water Flow: you can individually adjust the emitter,turning the water flow to sprinkler water or dropping water according to the precise needs of your plant. Wide Application: widely used for agriculture, garden, lawn, garden, patio, greenhouse or potted plant etc. ● If leak happens, your faucet maybe come into being slip, please use the teflon tape to wrap around the its mouth before installation. 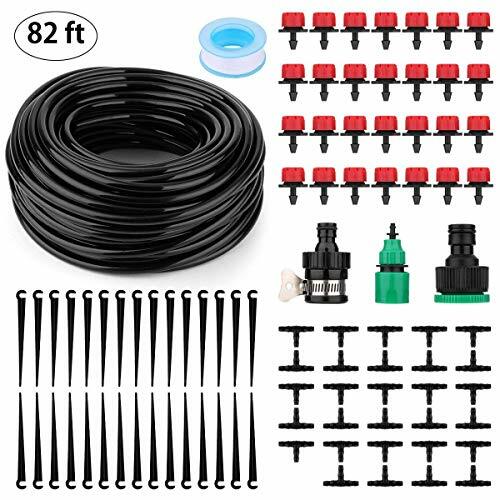 【Set-up Your Own Watering Irrigation System】- this plant watering kits including 82FT 1/4 inch tubing hose, 30pcs adjustable emitters, 1pcs threaded faucet connector, 1pcs universal faucet connector, 29pcs tee pipe connector, 30pcs support stakes and 1pcs teflon tape, which is enough for you to set up your own plant irrigation system on patio, garden, greenhouse, landscaped areas, or balcony. 【Time & Water Saving】- This automatic drip irrigation system not only keeps you from having to water your entire garden by hand on a daily basis. What is more, this plant watering system can save up to 70 percent water comparing to the manual watering, because it can more precisely direct the water to go exactly where the plants need, keeping them more green and healthier. Very practical and water-saving plant irrigation system. 【Easy Installation】- It is very easy to customize and expand your garden watering system. No special tools, glue or professional skills are needed. If you use running water, there is no need to add water pressure, just directly connecting to your faucet. 【Adjustable Emitter and 82FT 1/4" Tubing Hose】- You could make a good adjustment on the water flow, allowing each plant to receive its customized watering according to its precise needs. You could turn the water flow to sprinkler water or dropping water, or even turn water off. The 82FT 1/4" distribution tubing hose made by cold-resistant & high temperature resistant material is durable, wear resistant and long-lasting. 【Wide Application & Tips】- this self plant watering system could be widely used for agriculture, garden, lawn, garden, patio, greenhouse or potted plant etc. The connection will be more easier if you could soak the tubing in very hot water for a bit before inserting the fittings.